All the details you need to know about the IPL 2019 Schedule and Venues. 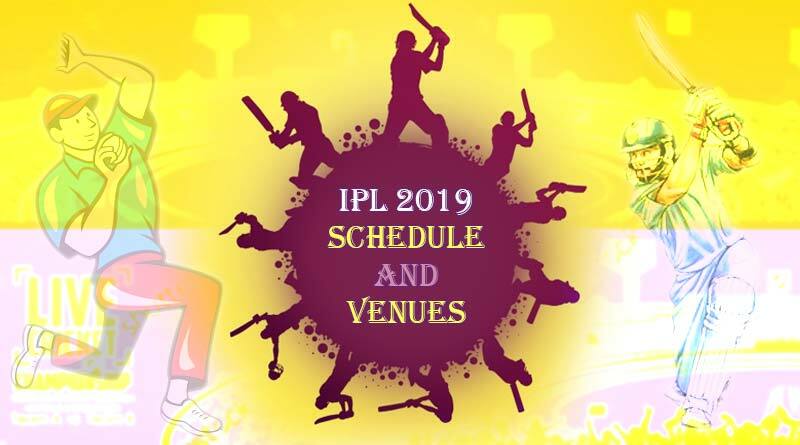 For all the cricket fans out there, the wait for the complete Indian Premier League (IPL) 2019 schedule is over as the entire schedule is now out. Here are all the details about the participating teams, venue and timings of the IPL. Speculation for a change in the schedule for the IPL was a highly talked about the issue with several reports coming in from the cricketing fraternity that suggested the tournament might be taken out of the country entirely with the general elections slated for the same time as the marquee tournament. However, in a major relief to the BCCI, organisers and broadcasters in a meeting between government officials and the pertinent BCCI members spared the tournament from having to move to a new land with a change in dates and venues seeing IPL 12 stay in India. Assuring people that the tournament would be conducted as per its norms within India, the BCCI in a statement said that based on successful discussions, the government has decided to give the go-ahead for the tournament to be held in the country. “Based on the preliminary discussions with the appropriate central and state agencies/authorities, it was decided that the 12th edition of the world’s most popular and competitive T20 tournament will be scheduled to be played in India,” the BCCI said in a statement. While a date for the tournament still has to be zeroed down, it is widely regarded that March 23 should be the day when the tournament opener gets underway. Another contentious issue that has hindered the schedule of the IPL is the world cup which is set to be staged from May 30, making it necessary as per the recommendations of the committee to see the IPL wrap up two weeks before the glamorous world cup. To accommodate itself around a congested schedule, the BCCI has decided to go in with March 23 as the tentative date so as to ensure that all the participating players are given more than ample time to go back to their countries and get in full swing with the preparations. “IPL will have to be advanced as captain Virat Kohli and coach Ravi Shastri have asked for a minimum of two-week rest period ahead of the World Cup for fast bowlers. They have raised this demand during their meetings with the Committee of Administrators (CoA) as well as BCCI board members,” a BCCI official said in reference to the pushing of dates earlier than usual. The confirmed dates and venues for the Indian Premier League will be announced once the list for the dates of the general elections is out. However, a provisional schedule subject to change could be announced by the BCCI in the coming days, to give the franchisees and players involved a clearer idea of when to begin with their preparations and their team’s schedule and fixtures. What is being heavily mulled though is increasing the number of cities to host the tournament in, so as to allow the government to allow adequate and the necessary security arrangements in what will be a hectic period for the agencies involved. The home and away format being done away with for this season of the IPL, every side will be given just 3 matches at their home stadium with the remaining of their 7 fixtures being played across different sporting venues across the country. If further reports are to be believed, the BCCI has included some of the states and cities which get to see less cricketing action as per their plausible venues to take away the rest of the matches. Apart from the usual home stadiums of Delhi, Mumbai, Chennai, Kolkata, Bengaluru, Mohali, Jaipur and Hyderabad, cities like Pune, Lucknow, Kanpur, Thiruvananthapuram, Vizag, Ranchi, Cuttack, Rajkot, Raipur and Indore seem to have been included in venue list. The 2019 edition of the IPL will also see less global participation keeping in mind the world cup. No Australian player, part of the World Cup squad will participate in the tournament after May 1 while players from countries like England, South Africa and Sri Lanka will also leave early which was evident in the auctions where players from these nations were generally stayed away from. Players from New Zealand and West Indies have no such issues though and they will only return back after playing the full season of the league.